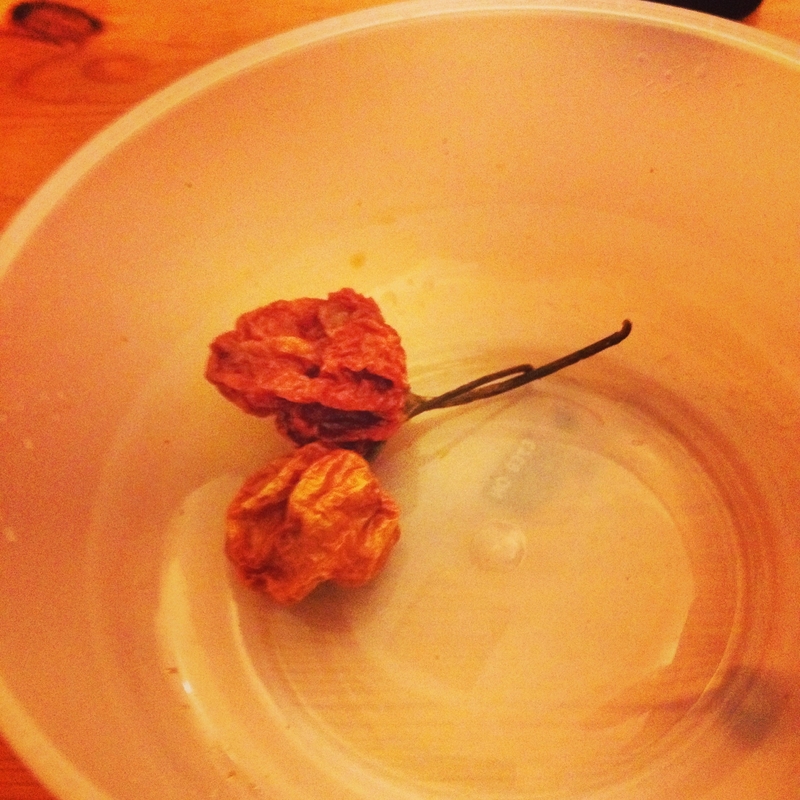 Just before Christmas, Alanna was gifted with two dessicated Trinidad Moruga Scorpion peppers by her coworker. They came with disclaimers and lurid warnings of blindness, insanity and death-so what better way to warm up after the Christmas than to dump them into a chili? Alanna, Casey, and myself were all apprehensive about this scorpion. It’s notorious, heads the Scoville scale and comes with warnings about the use of ventilated spaces and gloves. Alanna just wanted the seeds, Casey silently urged me to use them in a dish, and I really just wanted to eat them. Well, whatever. I caved last night, secured Alanna’s permission to use one of the peppers, and duly made it. It honestly wasn’t that bad. I did remove the seeds and insides because Alanna wants to grow a plant, and only used the skin, but it really wasn’t that bad, heat-wise. The taste was lovely. I added a second less-spicy (Caribbean) pepper for flavour. It was a mix of musty (from the Caribbean pepper) and sweet/citrusy from the Scorpion. The heat built up and stayed around for a while, but didn’t outstay its welcome. Casey inhaled three bowls, and had diarrhea later, while I ate two, and wrestled with heartburn all night. It was good, and I would heartily recommend this to anyone who’d like to try real heat. I’m going to try and find more in the new year, or maybe just puppy-eye Alanna until she grows more. I hate big chunks of soft things in food. I gag. So I don’t use chili beans. YOLO. Serves 3-5. 800 grams of minced beef. Just get a flat of beef from Tesco or Lidl. 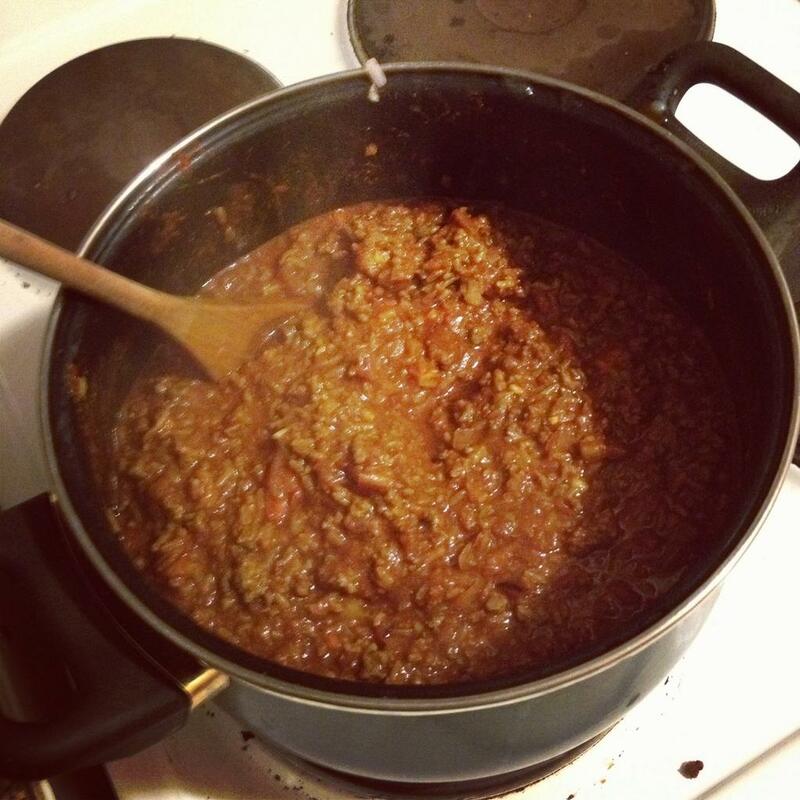 You can substitute this with any other minced meat, or meat analogue. 1 whole large diced white onion. 1-2 diced scotch bonnet peppers. 2 Oxo beef stock cubes. 1.5 cups of brown rice. 1 carton of tomato passata. 1/3 tube of tomato paste. 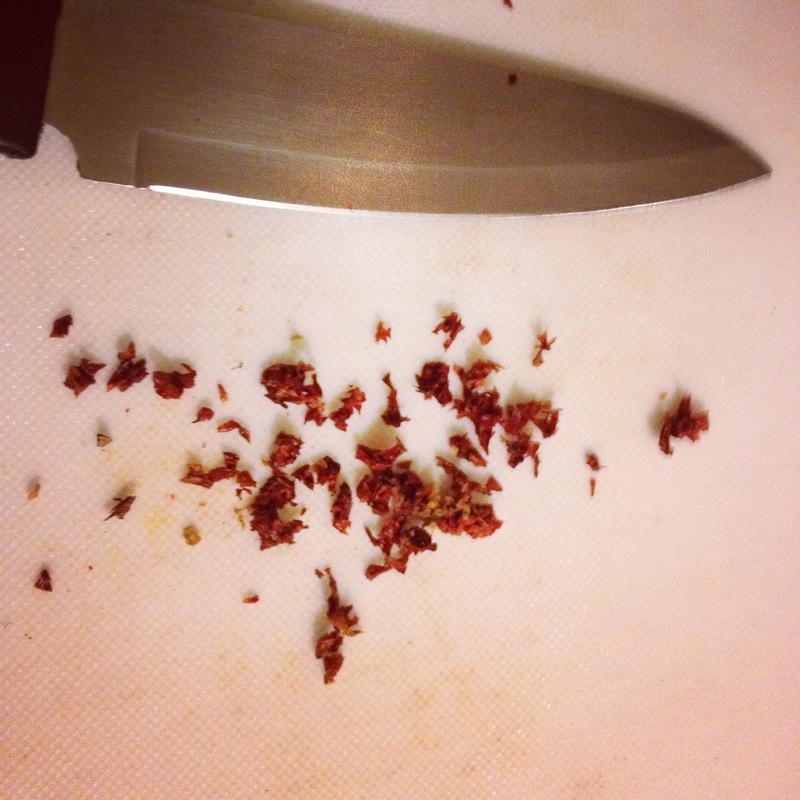 1 tablespoon of gochugaru (dried chili flakes). 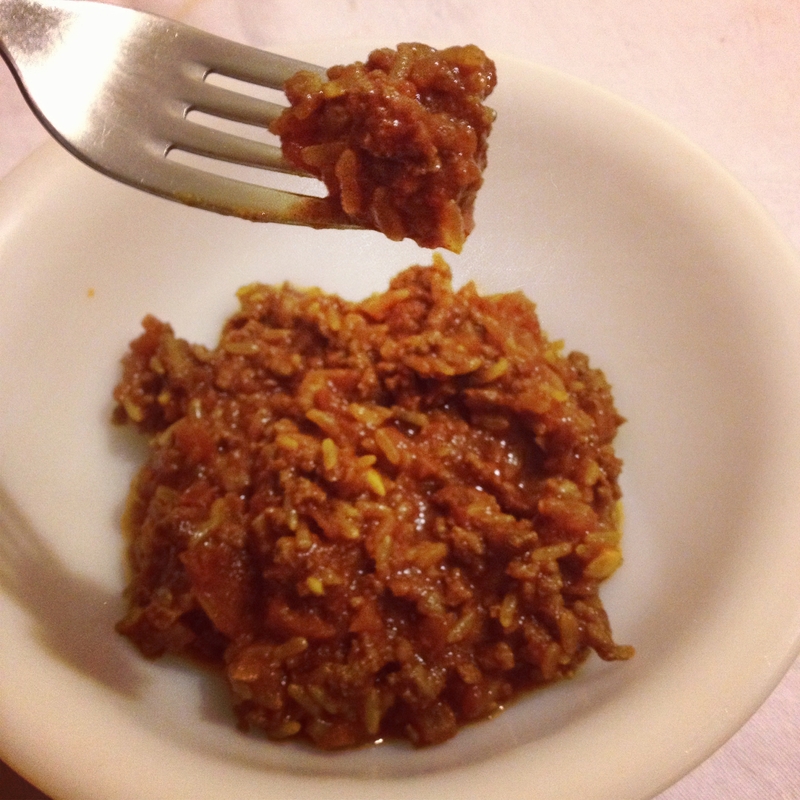 1 tablespoon of gochujang (chili paste). Simmer beef until brown. Break it up. Drain. Add beef to a pot. Add everything else. Bring to a boil. Simmer down at the lowest heat. Stir frequently to stop sticking and burning.